Call of Duty to get WoW-Like Subscriptions? Activison CFO Thomas Tippl has said the company is looking into monetizing the online components of some of its biggest franchises. At the BMO Capital Markets Conference Tippl said that gamers should expect to see efforts to monetize Activision games in the near future. "It's definitely an aspiration that we see potential in, particularly as we look at different business models to monetize the online gameplay," he said. "There's good knowledge exchange happening between the Blizzard folks and our online guys." "I think it's been mutually beneficial, and you should expect us to test and ultimately launch additional online monetization models of some of some of our biggest franchises like Call of Duty." 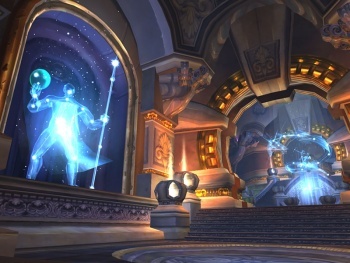 According to Tippl, a monetized platform would work, citing DLC and WoW's successful subscription model as evidence. "Our gamers are telling us there's lots of services and innovation they would like to see that they're not getting yet. From what we see so far, additional content, as well as all the services Blizzard is offering, is that there is demand from the core gamers to pay up for that," he said. What's especially worrying about Tippl's comments is that he might be right. Modern Warfare 2 sold in enormous amounts, and if the next iteration involves some subscription fees to get the best experience, Activision could do very, very well out of it.